On many blogs in the blogosphere, folks are already decorating their mantles for Fall, but whoa! I am not ready. Here's how my mantle looks today. 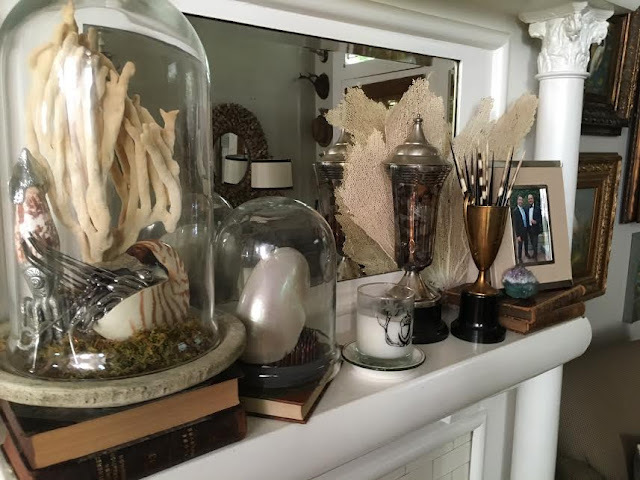 The mantle is filled with many of my favorite things --- vintage trophies, leather books, glass cloches, and shells of the sea. I love the reflection in the mirror too. Looking good, Ron! Love the vintage trophies. Are those quills in the one on the right? The store on Magazine that I really liked is Appartique. Do you know it? I'm not ready for Fall decor, it's still too hot here in the South! Love your mantel. Your mantel looks wonderful- I always like why you do! I'm dragging on jumping into the fall decorating but my mind has wandered in that direction. Oh Ron, this is so pretty. Thank you for not getting cozy with autumn just yet. It's summer. It's hot. It's the south. We love the beach. Hang on. Don't give in. When the time is right, you'll rock some pumpkins and witches while the other bloggers are crying because they're so tired of their pumpkin spiced lattes.